Human Rights Watch slams yet 'another extra-judicial killing by forces linked to Hamas', after senior commander killed for 'spying'. Human Rights Watch has condemned Hamas' execution of one of its own fighters after the Palestinian terrorist group's military wing said the killing was carried out at the weekend. The Al-Qassam Brigades - the armed wing of Hamas which rules the Gaza Strip - said it had executed one of its members on Sunday, with sources familiar with the case calling him a senior official accused of spying for Israel. "The Al-Qassam Brigades announce that the death penalty pronounced against its member Mahmud Eshtawi has been applied today," the Brigades said in a statement. Responding to the announcement, Sari Bashi, the Israel and Palestine director at Human Rights Watch, called it "another extra-judicial killing by forces linked to Hamas." "If Hamas really cares about defending the rights of Palestinian people, it will act to punish and prevent the killing of any Palestinian in rogue procedures outside the semblance of law and justice," said Bashi. 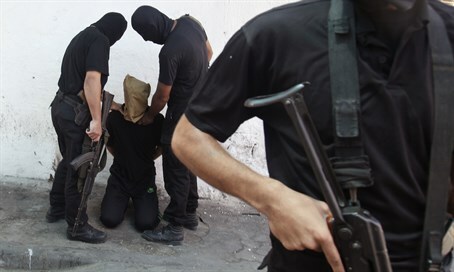 Hamas has long carried out executions against those accused of spying in the Gaza Strip, including in public squares and often without transparent trials. However this killing appeared to be the first time Al-Qassam itself had sentenced one of its own through a court martial and executed him. Al-Qassam did not provide details on the accusations against him, other than to say that "the Brigades' military and Islamic judicial committee issued the sentence because he violated rules and ethics." Eshtawi's duties included overseeing tunnels that have previously been used to store weapons and carry out attacks against Israel, sources said. According to the sources, he was in charge of a large unit and was previously a close associate of Mohammed Deif, the Al-Qassam chief who has been a frequent target of Israeli assassination attempts. Since the start of 2016, four Gazans have been handed death sentences after being accused of spying for Israel. The Gaza Strip has seen three wars with Israel since 2008.